FILE - Julie Andrews presents the award for best original score at the Oscars at the Dolby Theatre in Los Angeles, Feb. 22, 2015. The hills are alive with the sound of a big, lucrative anniversary. The 1965 Oscar-winning film adaptation of the Rodgers & Hammerstein musical "The Sound of Music'' is celebrating its 50th birthday this year and its star Julie Andrews can't quite believe it. "This is a lovely moment to mark. I've been saying all along it's like a very bad joke because surely it was only 30 years ago - not 50," she said. "I feel I lost 20 somewhere along the way. A little thing called life got in the way." The movie that popularized whiskers on kittens and warm woolen mittens isn't holding back on its golden anniversary: There are events, DVDs, books, soundtracks and screenings. Other American movie musicals may be revered - "Cabaret" and "West Side Story," for example - but few are as beloved as "The Sound of Music." Andrews, 79, thinks she knows why. "This one stuck because it was very well made with beautiful music and a lot of glorious assets like scenery and mountains and children and an adventure story and a love story and all of that," she said. To honor the milestone, 20th Century Fox is releasing a five-disc Blue-ray/DVD collection, the soundtrack is being re-released, and the film will be screened at the TCM Classic Film Festival in Hollywood later this month and over 500 movie theaters in April. Four new books about the film are being published, and there's a Diane Sawyer-led "20/20" special airing on ABC Wednesday featuring an interview with Andrews in Austria, where the story was set. Princess Cruises will also celebrate the anniversary with special screenings and sing-alongs. The musical and movie are a fictionalized account of the life of Maria von Trapp and tell the story of a 1930s governess who teaches her charges to sing and falls in love with her employer, naval captain Georg von Trapp, and the family's flight before World War II. Angela Cartwright, who played Brigitta von Trapp, said cast members have gone through ups and downs and births and deaths during the past 50 years but "when we all get together, we pick up where we left off." "It was an honor to be a part of such a great movie," she said. "When we were filming it, we had no idea that it was going to last and be so successful. It was such a charmed part of my life." 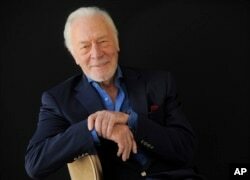 FILE - Christopher Plummer poses for a portrait at the Beverly Hilton Hotel in Beverly Hills, California, July 25, 2013. Not everyone is reveling in the film anniversary with the same fervency, especially her 85-year-old co-star Christopher Plummer, who played Captain von Trapp and has in the past derisively called the film "The Sound of Mucus." "I've never really knocked the movie; I just knocked the experience of playing a part which I didn't think was very exciting, that's all," he said. "I thought I was the cat's meow and this was very much inferior stuff." Andrews doesn't begrudge Plummer his view and the two have remained buddies. In fact, Plummer's less-than-earnest performance may have helped the movie. "He gave it an astringency the film needed because it is a slightly saccharine story," said Andrews. "He was so great in it and we stayed good, good friends." Even before this year, "The Sound of Music" was never far from the popular consciousness. Kelly Clarkson and Mary J. Blige both recently covered "My Favorite Things" and NBC cast Carrie Underwood as Maria in its live version in 2013, which drew 18.6 million viewers. This image released by NBC shows Carrie Underwood, foreground, as Maria, during preparations for "The Sound of Music Live!, in Bethpage, New York, Dec. 4, 2014..
Andrews, who called Underwood's performance as Maria "wonderful,'' is not precious about holding onto the role. She wants more people to play it and try their hand at putting on a musical she calls a "gift." "After 50 years, one should be allowed to interpret it anyway you hope to do it. Do it with puppetry. Do it with live actors. Do it any way. Because it's a classic," she said. "It is a gift, in a way, to all of us." This year, we've had an extended "Sound of Music" medley by Lady Gaga at the Oscars and a brief nod to the film in Jason Robert Brown's movie musical "The Last Five Years." A national tour of the musical led by Tony Award-winning director Jack O'Brien will launch in September in Los Angeles. It's not a bad legacy for an $8 million film that originated as a Tony Award-winning Broadway show but was critically panned. (One prominent critic called it a "sugar-coated lie.") The film won five Oscars and stands as the No. 3 domestic box office champion of all time, adjusted for inflation, following "Gone With the Wind" and "Star Wars." But for Andrews, the 50th anniversary, for which she has endured hours of questions from journalists with her typical uncommon dignity and good humor, may mark the last celebration. "I think this is probably it, I would imagine. People have been joking with me all along, saying 'You'll be back for the 100th,'" she said, laughing. "The mind boggles."